Compressed natural gas is widely used in many European countries, among which Italy stands out, with around 1,000,000 compressed natural gas vehicles in circulation. ENGIE developed already approximately 150 CNG filling stations, especially in France and in Belgium. Romania is one of the few countries in Europe where the compressed natural gas vehicle technology has not yet been implemented on a large scale, but, given the maturity and efficiency of the solution, it has potential for development, especially for companies which own large vehicle fleets. 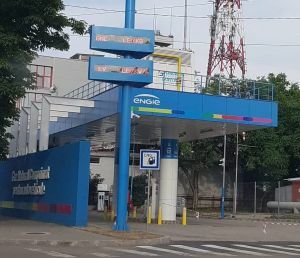 Anticipating these developments, ENGIE Romania inaugurates the first public compressed natural gas station for vehicles in Bucharest. In the medium term, the company’s intention is to develop a network of CNGv stations, whether public or private, for partners interested in this solution. “This green mobility development project reflects ENGIE’s strategy to reduce pollution generated in the transport sector, in the context of an accelerated urbanization. Our tradition as a major natural gas player gives us strong leverage to develop this alternative technology for a wide range of customers, from transport operators to companies owning large light or heavy vehicles fleets. 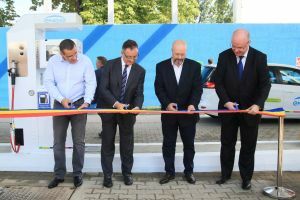 The station inaugurated today is our first step in a market with significant potential and ENGIE Romania has already purchased 25 compressed natural gas vehicles for its fleet.” stated Eric Stab, Chairman & CEO of ENGIE Romania. The CNGv station is located in district 6 on Preciziei Boulevard in an intensive traffic area. Heavy vehicles, such as buses, but also cars can be fueled in the station, with the help of a certified operator and the payment will be made through a dedicated terminal, allowing all payment methods (bank card, fleet card, cash and voucher). The station is open from Monday to Friday from 07.30 to 21.00 and Saturday from 8.00 to 12.00. This alternative fuel station is also equipped with an electric socket to charge electric vehicles.